from a life of crime and violence and fulfil their potential. through the mediums of sport, arts and education. Will died during his gap year in Central America as a result of street crime in 1996. As a family, we wanted to do something in his name to make a difference. Le Loop is WWMT’s principal fundraiser. Our goal is to raise over £400,000 each year. We, the Trustees of the William Wates Memorial Trust are Will’s family – his parents (Andrew and Sarah) and his 4 brothers (Tim, Jonny, Rick and Monty). We are incredibly proud that the next generation are getting involved in Le Loop, with Will’s nieces and nephews coming to cycle stages. “We created the event in 2006 as a fundraiser (then called ‘Tour de Force’), inviting friends and family to challenge themselves to ride stages of the Tour de France. Taking 4 years to recover (! ), we did it all again in 2010 and realised that everyone should have the chance to ride the tour. We have run the ride every year since 2012. To date, the event has raised over £3 million for the charities we support”. 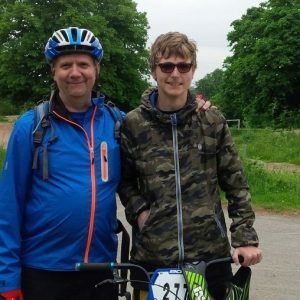 “The fact that I was able to raise much more than (my £1500 fundraising target) is a testament to the quite extraordinary reason that the WWMT exists: principally that, as a family, you chose such a way to remember Will and create a legacy that will far outlive the sad and wasteful circumstance of his passing. “The Le Loop celebrates Will’s life and continues his legacy by supporting young people who don’t have the advantages in life that many of us take for granted. Will was aware of his privileged background and was keen to help others – the aims of the Trust reflect where his interests would have been if he were alive today”. Click here for a full list of recipient charities. The William Wates Memorial Trust supports charities, many of whom engage with young people through sport. to join us on tour for a stage as Charity Visitors. They ride either a full stage, or as much of it as they possibly can before then helping our team at a feed station. our riders after dinner about their experiences, the work of their charity and just how the WWMT grant has helped them. during their tour to help them prepare and get the most benefit from the experience. 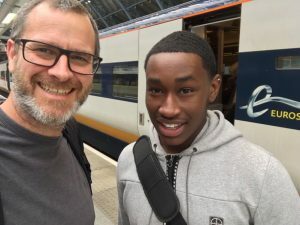 A young person gets the opportunity of a lifetime to come and ride a stage of the Tour de France, to challenge themselves not just on the bike, but to talk to the riders who are supporting them. Our riders get to meet one of the young people their efforts are supporting and ask them, face to face, about their life and the work of their charity. They also have a unique opportunity to support them in their ride during the day, sharing the camaraderie of the peloton. 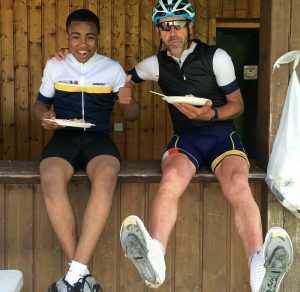 Tyrese came out, fresh from his GCSE exams to ride in the Alps, accompanied by his key worker Thandi. He conquered the bulk of the stage showing enormous determination and strength of spirit. He spoke to the group about his experience as a participant of the Duke of Edinburgh award scheme that is funded at WHYC by a WWMT grant. Thandi also talked to the riders about his work and WHYC and explained: “we never give up on any of our kids”. I am just applying for Summer jobs and I think this is a great thing to put on my CV. Not many people get to say they have been out to cycle part of the Tour de France and I am sure I will be asked about it in interviews”. Jonny is involved in a BMX project that is part of the Access to Sport program. He came out with his Dad and was particularly keen to spend time with our mechanics and support crew.